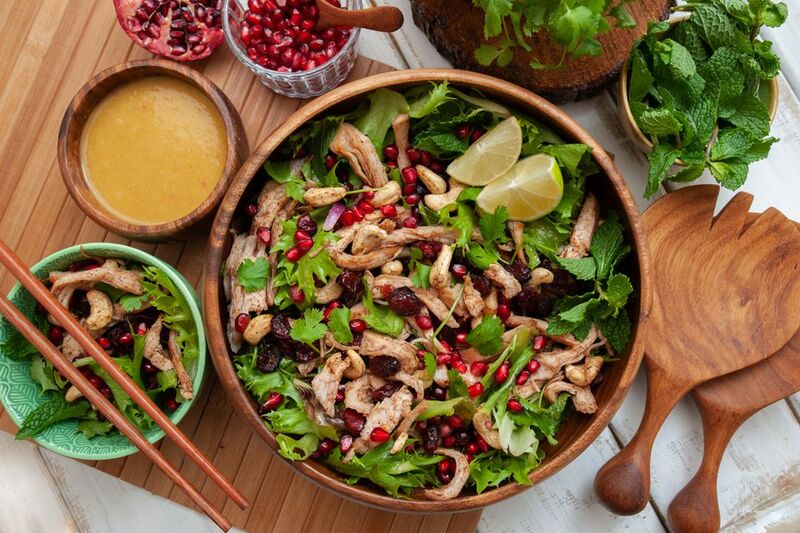 Ditch the turkey soup or sandwich (the favorite stalwarts of leftover turkey) for this fresh, zingy Asian-spiced turkey salad. Not only is it tasty with all the fruits, nuts, salad leaves and herbs, it's also good for you. The salad is a delicious blend of Asian spices, aromas, and fruit and can be prepared in advance and served cool or hot. The dressing can be made in advance and stored in a jar in the fridge. Use the dressing on salads, in stir-fries, or as a dip for crudites or tempura dishes. It's truly that versatile. Note: while there are multiple steps to this recipe, this salad is broken down into workable categories to help you better plan for preparation and cooking. Put all the dressing ingredients except the olive oil into a food processor or blender and whizz together to produce a smooth sauce. Measure the sauce and add twice the amount of extra virgin olive oil. Whisk thoroughly then cover with a cloth and put to one side. Heat up a large frying pan and add the leftover meat, nuts, and cranberries and warm through, shaking the pan to prevent sticking and burning. Add the five spice powder and stir thoroughly, add the honey, and stir to combine. Cook for 3 to 4 minutes to make sure everything is hot. Place the salad leaves in a bowl, add fresh mint and coriander, and drizzle with the dressing. Add the meat, fruit, nuts and pomegranate seeds. This salad also works with leftover duck, chicken, and even leftover goose. You can vary the herbs and salad leaves, but mint and fresh coriander works the best. Any leftover dressing can be stored in a screw-top jar and used within the week.